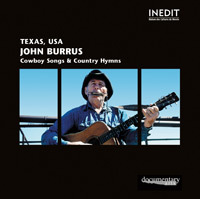 John Burrus started singing when he was twenty-three years old. He was a rodeo cowboy, who, while the other cowboys went into town, stayed back at camp to practice his guitar. He learned a few basic chords, G, D, C and A, and then tried singing along as he played. He remembered the traditional songs he had heard as a child and later added to his repertoire his own arrangements of songs he saw in cowboy song books and hymnals. 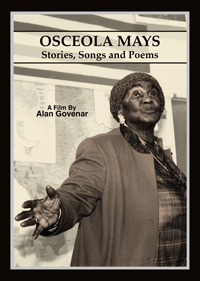 The spirituals and poems of Osceola Mays are remarkable indeed. In them, the past is recounted with a reverent intensity that expresses the deeply felt emotions of three generations of black Texans. 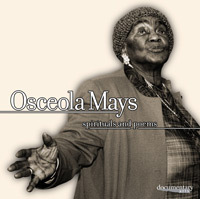 The harsh realities of segregation and discrimination are juxtaposed with the importance of family and community life in these spirituals and poems learned by Osceola Mays from her mother and her grandmother. This poignant film follows Osceola from her home in South Dallas to the Good Street Baptist Church and Spence Middle School, and juxtaposes the harsh realities of segregation and discrimination with the joys of community life. Together, Osceola’s stories, songs and poems chronicle three generations of suffering and hope and stand as a metaphor for the African American struggle for survival against all odds. 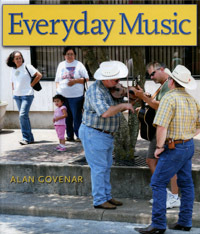 Between 1983 and 1988 Alan Govenar traveled more than 35,000 miles around Texas, doing fieldwork for a radio series called Traditional Music in Texas for the National Public Radio station in Dallas. His book Everyday Music begins where he left off years ago. Features chapters on Osceola Mays and John Burrus. A sharecropper's daughter describes her childhood in Texas in the early years of the twentieth century. 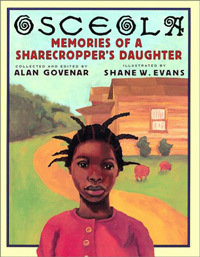 Alan Govenar gathers Osceola Mays recollections into a children's book illustrated by Shane W. Evans. First Prize, Boston Globe – Horn Book Honor Award; First Place, Nonfiction Picture Book, New York Book Show; Orbis Pictus Honor Book for Outstanding Nonfiction for Children; ALA Notable Children’s Book. 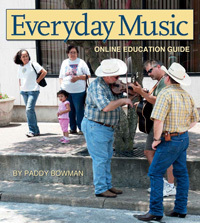 Download the free education guide for Alan Govenar's book Everyday Music. The guide features a unit on each artist profiled in the book and a variety of worksheets that provide scaffolding for an array of approaches for applying the content. Each unit includes background information for educators, student objectives, potential big ideas or themes where the unit might fit, subject areas, preparation, class discussion prompts , suggested activities, a list of student products to use in assessment, a vocabulary list, a short summary of standards, and resources.